My eczema does not seem to show any sign to be abated. What seemed like a simple skin discomfort has developed into full-fledged eczema in a space of less than a year. During my trip to Shanghai, I had another outbreak of eczema. It was not helped either with Shanghai being cold, most days the temperature never break the 10degC barrier. I have always had problems with the day being cold; my skin would get very dry. 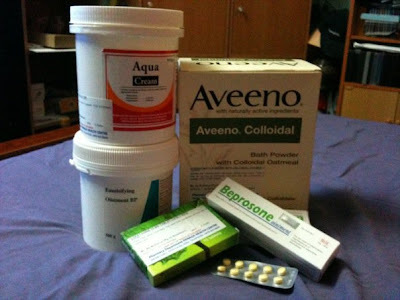 This time, it was worse; I developed eczema spots on my legs and arms. So this morning, I went to Panaga Health Centre for help. I had been going to the Skin Clinic at RIPAS Hospital, but after repeated similar prescriptions, I got fed up. One of the doctors at the Skin Clinic also said that one of the doctors at the Panaga Health Centre had an interest in skin diseases, so I thought I might give it a try. I heard almost the same things too; my skin was too dry, it could flare up anytime, bla, bla, bla. But I also learnt a few other things. The doctor believed that I might not be allergic to any food and the eczema was probably contact eczema. I also told to ditch my current Johnsons and Johnsons' pH 5.5 shower cream, which I had been using since I swtiched from Dettol a few months back. I was advised to use soapless shower cream, one of which was from QV, which costs something like BD35 per litre! As a reward to my effort to see the doctor, I was given a big tub of moisturiser (I was also told to stop using Vaseline or Nivea moisturiser! ), a big tub of soapless shower thingy (to see if they would actually work), a nice package of oatmeal-based ointment (which is to be added to my bath water and I would have to soak for 10-15 minutes), some steroid cream and some anti-histamine tablets. I left the Health Centre, looking as if I had just shopped at Guardians! Another wait for a fortnight would tell if this regime of medicine would actually work. I hope it does. Hi, what is the link to the panaga health centre? I've been trying to google it, but only your blog came the closest to it. I am not too sure if there is a public website for Panaga Health Centre. But you could contact them at 3373033.